Some of the most traditional and fascinating Amazonian tribes are located in the Javari River Valley on the border of Peru and Brazil. The Matses tribe still live primarily as hunters-gatherers and practice traditional Amazonian ceremonies. This photo gallery contains some wonderful images of the Matses people and their rituals. In no other region of the Amazon Rainforest will you encounter such traditional people who have retained their original native culture to such an extent. he Matsés people are a native indigenous tribe from the Brazilian and Peruvian Amazon Rainforests south to the more commonly known Native American Tribes. At present the biggest threat to the Matsés and their indigenous Amazonian communal territory is poaching by mestizos (non-native Peruvians and Brazilians), logging and oil companies. The Matses Native Community is located in the region of the Yavari (Javari in Portuguese), Chobayacu and Gálvez rivers on the border of Peru with Brazil. The Matsés people have been defending their land and culture from outsiders for centuries. In 1969, they finally ended their isolation and war with outsiders when they accepted two female Christian missionaries into their community. The Matsés (commonly referred to as Mayorunas or Mayurunas in Brazil) speak a northern Panoan language which is closely related to the dialects of the Matis and Korubo Indian tribes. During the last 30 years, the Matsés have significantly changed their semi-nomadic way of life by settling in more permanent communities. Formerly, they would move their communities every few years after exhausting the resources of an area. Although they have changed their settlement pattern, they still rely on the rainforest for almost all their food and resources. Hunting, fishing and subsistence tropical agriculture provide the Matsés with virtually all their food and material implements. The Matsés are an indigenous people native to the Americas, hence their commonly being referred to as the "Matses Indians" or "Matses Amerindians." The origin of the Matsés tribe is largely unknown. However, some believe that the Matsés people may have originally been located near the Huallaga River in Peru when they first made contact with Jesuit Missionaries in the 18th Century. According to this theory, after disease epidemics devastated their population, they fled to their present day location on the Peruvian-Brazilian border and avoided all contact with outsiders. Historically, the Matsés had only two methods of coping with outsiders, either killing them or integrating them into their tribe. The origin of the term that the Matsés people use for themselves (Matsés) comes from the word meaning "people" in their own language. Similar to other Amazonian Indians, the Matsés have an extensive knowledge of the Amazon Rainforest and its plant and animal resources. In addition to hunting and gathering, they practice typical Amazonian slash and burn agriculture in which timber is harvested, tropical crops are planted, and soil nutrients are exhausted. An agricultural system such as this necessitates frequent moving of communities to different areas for new resources, hence resulting in a semi-nomadic existence. Like most Amazonian natives, the Matsés people are presently living in more permanent settlements, and as a result these native Amazonian Indians are adapting their agriculture to more sustainable methods rather than abandoning their fields every few years. Although blowguns were used by the Matsés until the recent past, at present they most commonly use bows and arrows for hunting. Shotguns are also used, but are much less common due to the high cost of shotgun shells which in most cases are prohibitively expensive. 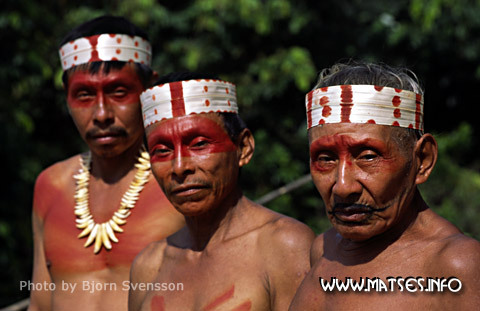 Similar to other Amazonian tribes, the traditional religion of the Matsés is Animism. As Animists they believe that there is no difference between the spiritual and physical worlds with animal spirits being ubiquitous in all things, both living and inanimate objects. The Matsés tribe believe that all plants have an association with specific animal spirits. For example, when using medicines derived from plants, the Shaman (or the recipient of the medicine) will speak to the animal spirit associated with that particular plant, requesting a cure, protection or enhanced physical ability. Typically, they will apply remedies externally to the body, rarely ingesting medicines. A common religious ceremony involves the use of a toxin derived from a poison tree frog (Phyllomedusa bicolor) and is referred to as kambo, kampu, or acate by Amazonian natives. The Matses are polygamists like many other Amazonian tribes with each man having one or more wives. Until recently, the Matses men commonly kidnapped and assimilated women from other tribes (or Peruvian and Brazilian women) into Matsés society. Traditionally, the Matsés lived in longhouses (malokas) that housed as many as 100 people. In general, marriages are between cross-cousins, i.e. a woman marrying the son of her mother’s brother. For the most part, Matses society is based on kinship, with family ties being the dominate factor in their political systems. Traditionally, the Matsés have not had chiefs either for their communities or their tribe. Like many Amazonian tribes, the Matsés had no social tradition of having chiefs until influenced by outsiders to do so. Important decisions affecting the community were traditionally made by mutual consensus between the elders males. It is important to recognize traditional political systems when making the transition to foreign political systems such as the present independently ruled Matsés Communal Reserve. At present, the Matsés are politically disorganized and very divided due to their traditional political systems based on kinship. Now each village has its own chief. However, there is little centralized leadership for the tribe, a situation that makes it easy for outsiders to manipulate and exploit the Matsés people. For example, at present outsiders are making plans to harvest the value timber from the Matsés Communal Reserve without informing or receiving the approval of the Matsés people. Until 1969, the Matsés tribe was essentially at war with the outside world, especially the Peruvian government because of the Matses tradition of kidnapping and assimilating women from the outside into their tribe. This tradition was the primary source of tension with Peruvians and reached its peak in the mid 1960s, when the president of Peru, Fernando Belaúnde, ordered his Air Force to bomb Matsés communities with Napalm. In addition, the Peruvian Army invaded and burned down their villages. As a result, the Matses abandoned their settlements on the rivers and fled to upland areas deep in the Amazon Rainforest. Two Christian missionaries from the Summer Institute of Linguistics learned the Matsés language from a Peruvian woman who escaped from the Matsés after being kidnapped. These female missionaries were accepted into Matsés communities and successfully ended hostilities with the Peruvians and other Amazon Indians. Moreover, they successfully implemented a system of bilingual education into the Matsés communities, a system that complements the Matsés oral tradition and helps maintain the Matsés culture from generation to generation. A grass-roots indigenous rights movement (The Movement in the Amazon for Tribal Subsistence and Economic Sustainability - MATSES) was formed by the Matsés teachers to prevent the exploitation of their people and lands by outsiders. The goals of MATSES involve the continued education of the Matsés people as to their cultural traditions. Moreover, MATSES seeks to end the continued manipulation of the Matsés by outsiders who are currently planning to harvest their timber and deplete their resources. MATSES is an organization that is providing for the survival of the Matsés people and their cultural. Currently, no outside support is reaching the Matsés people. The Peruvian government provides no medical aid and there are no health care professionals in the Matsés Communal Reserve. Unfortunately, a high percentage of the Matsés population is suffering from two preventable diseases: malaria and hepatitis. Currently, MATSES, is working with the Peruvian Ministry of Health to get medical care for the Matsés people. However, the physical isolation of the Reserve makes it difficult for physicians to travel to the Matsés Reserve. Unlike neighboring Amazonian tribes such as the Bora, Huitoto, Yagua, Ticuna, Shipibo, Marubo, Korubo, and Matis Indians, the Matsés people have title to their traditional territory. The Matsés Native Community was created in 1998. This indigenous territory measures 457,000 hectares and is located on the border of Peru with Brazil. The Matsés Native Community was created with funds that were donated primarily by land conservation organizations from the United States. However despite promises of aid, the creation of the Matses Native Community has done little to change the life of the Matsés who continue to be devastated by health care problems, especially malaria and hepatitis. Ironically, the transfer of land title to the Matsés people seems to have made it easier for outsiders to harvest their timber and destroy their natural resources. In addition, the Matses do not own the rights to the mineral resources on their lands and in July of 2007 these rights were sold by the Peruvian government's Peru Petro to a Canadian oil company, Pacific Stratus Energy. Amazon Tribes is an wonderful resource for info, references, and links for native Amazonians, especially pictures and videos of the indigenous tribes of the South American Amazon River region, focusing on Ecuador, Brazil, and Peru. Amazon Indians is the ultimate resource for information, images, and films on native Amazonian tribes. This non-profit organization is actively supporting indigenous Amazonian people in the Amazon rain forest so that they themselves can preserve their own cultures and lands in the manner that they choose. Amazonz is an unique educational website with quality photographs and video recordings of native indigenous tribes living the Amazon River Basin of the South American continent. Inca Trails is a valuable resource for information, photographs, and videos on indigenous people of the Andes Mountains of South America. In addition, numerous archaeological ruins such as Machu Picchu are featured. Camino Inca is an informative website with fantastic photographs and information on the various trails to Machu Picchu which was inhabited by the ancient Incas who were one of the most important of native indigenous people living the Andes Mountains region of South America. Friends of the Amazon is a nonprofit association whose mission is to protect the Amazon Rainforest and its people. They use legal actions to stop those who are trying to destroy the forest and its native indigenous people. In addition, they support the education and health of the indigenous people of the Amazon. Iquitos News is an online newspaper for the city of Iquitos, located on the Amazon River, and provides visitors information on where to go and what to do in this regional capital of the Peruvian Amazon.